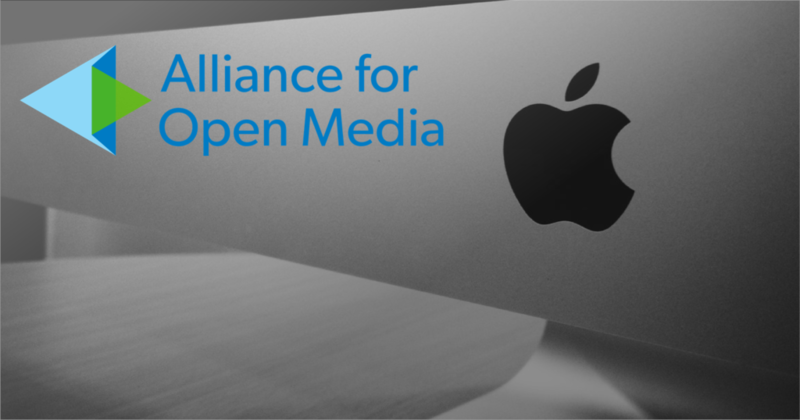 Last week, Apple quietly joined the Alliance for Open Media (AOM); while no official announcement has been made, Apple is now listed as a founding member of AOM, the consortium responsible for developing the open-source AV1 codec. This move could significantly impact the future of the codec landscape and broadcasters’ workflows, and help propel adoption of the highly-awaited royal-free codec. In the last decade, the codec landscape has operated with two competing video compression formats: the licence-based H.264 and HEVC (a.k.a H.265) standards developed by the ISO/IEC MPEG, and an open and royalty-free format developed by Google (VP8, VP9). For years, H.264 has been nearly ubiquitous, and the industry once expected a smooth transition to its successor, HEVC. At the same time, however, VP9 has been widely adopted in the Google landscape, has gained headway in Android and garnered significant interest from major industry players. Committed to producing entirely free and open codec specifications, some of the industry biggest players joined together to form the Alliance for Open Media in 2015. Focusing on the development of VP9’s successor, AV1, AOM’s founding members include both hardware and software heavyweights such as Amazon, Cisco, Facebook, Google, IBM, Intel, Microsoft, Mozilla, Netflix and NVIDIA. In 2017, multiplying patent pools and the threat of additional HEVC royalties for both broadcasters and device manufacturers further deterred the adoption of the licence-based codec and threw the spotlight on AV1 as a viable alternative. The one notable holdout was Apple, which announced support for HEVC as its primary video format in June 2017, even amidst the uncertainty. A change of heart (and hardware)? Apple’s intentions in joining AOM are not yet clear, although it would point to a commitment to support AV1 in Apple hardware. As delivering to Apple is a top priority for the vast majority of content providers, this support could be a catalyst for widespread AV1 adoption. If Apple does decide to support AV1, it is a clear sign that the largest players have come together to support open and free standards for the benefit of the entire industry. It would also signal commitment to eliminating some of the complexity that has been created in the past by competing interests. If all hardware transitions to AV1 support, broadcasters could more easily choose this royalty-free option and potentially cut both storage and delivery costs. We have a ways to go before any of these hypotheses become reality. The code freeze for AV1 is set for this quarter and the codec will not be released until major players sign off on its performance. The codec will then need to go into browsers and devices. With Google and Mozilla – and now Apple – behind the initiative, we can expect browser support to be swift. Hardware support is more complex, although fortunately many hardware manufacturers already participated in the codec’s specifications. AOM has (perhaps optimistically) indicated that we could see the first chip releases as early as late 2018 – a far cry from the 3-5 year delay for HEVC and older codecs. Lastly, encoders will need to be optimized to encode to AV1 in real time. One of the main hurdles for AV1 has been time to encode, which will need to be cut significantly for deployments off-the-shelf. Nevertheless, Apple’s addition to AOM founding members list is a milestone. Greater clarity should come over the next few months, and especially as we see the first results of AV1 deployments. We look forward to seeing AV1’s ability to deliver higher quality at much lower data rates. In lab tests, AV1 has been upwards of 30% better than HEVC – matching HEVC quality at about 75% of the bitrate – and we’re excited to see its compressing power. Stay tuned for more updates.